It has now been almost 3 years since Mike Bird and I launched the Journal for the Study of Paul and His Letters (Eisenbrauns). It has been a busy and arduous, but rewarding experience. I thought I would pass along 10 ten lessons I have learned (or continue to learn) about publishing articles. Being on the “other side” of the process has been illuminating and I hope the following advice will improve your research and also give you a healthier perspective on the process. 2. Send an article that is representative of your best work and professional identity. An article that is full of misspellings and grammatical errors is not professional. If your first language isn’t English, you cannot be blamed for making English spelling mistakes, but you are expected to take the time to have a friend, colleague, or mentor help you out and proofread your article before you send it off. Also, sometimes students send us a term paper that looks like a term paper. Please take the time to re-work and even re-write it into an academic article. When you send an article to an editor, you are sending a part of your public, professional self. Just because you send it over email, doesn’t mean you have permission to send off something sloppy. Editors, while not the primary reviewers (who are “blind”), still have an importantly advisory and even executive role to play in finally accepting articles. I have worked with some sympathetic editors who accepted my work in spite of some of my own sloppiness and irresponsibility (arising mostly out of lack of experience and understanding at that point). I am deeply thankful for them, but I am embarrassed that they know me as a sloppy writer. Learn from my mistakes. As an editor, I see what it looks like from the other side, and it can be annoying and burdensome to have to deal with lazy writers. 3. Creativity and originality are extremely important. Our reviewers (like most other good journals) have been around for a while and they have read hundreds of articles (either for personal research or for journal assessment). Many of them read grad essays on a regular basis. So, it takes quite a lot to impress them and show them something that is publishable. 4. Clarity and simplicity are undervalued authorial virtues. Sometimes when I read an article (for JSPL or otherwise), I am embarrassed that I cannot follow it or I don’t understand what the author is talking about. But, then I think – if I can’t understand it, and I have a PhD, who CAN understand it? What kind of audience is the author writing for, if someone like ME cannot follow it? Often, but not always, a convoluted and complex essay is inscrutable, not because it is “learned,” but because the author just didn’t invest enough in writing clearly. Some of the best articles I have reviewed or read are ones that are elegantly simple and clear. I have noticed that Jimmy Dunn has a knack for this. 5. Comprehensive footnotes are not as important as they used to be. A half-century ago, academic articles were expected to interact comprehensively with a topic (especially before there were online search tools and multiple bibliographic indices). Nowadays, because there are so many journals, and so many ways to get at the same information, you really do not need to cite every article, essay, monograph, and commentary related to every point you make. You definitely need good evidence from sources to back-up your thesis, but aim for the most eminent, cogent, and reliable sources. Again, your goal is to convince the reader of your argument, not demonstrate how much you have read. My supervisor once confronted me with a tough question – do you write such long footnotes because, in the end, you are not as confident in your argumentation that you have to hide behind mountains of citations? 6. Stay focused. Most articles could lose about 10-30% of excess baggage by just sticking to the main concerns. After you have drafted your article, go through and ask yourself –do I really need all the sections and paragraphs I have here? Can my case be made with a shorter paper? Why all the extra words? Are there unnecessary rabbit trails? 7. Interact internationally (and beyond English-language literature only). Not only should you interact with the most important German literature, but also think internationally in terms of English-language secondary literature. Some journals out of places like South Africa and Australia, for example, are excellent. There are also some outstanding books and articles being produced in Scandinavia – what do you do if it’s in Swedish (and you don’t know Swedish)? I would run it through a rough online translator to get a gist for its content and, if it is relevant to your research, make a Swedish friend and ask for help (perhaps even involving $$$). 8. Be patient in the review process. The reviewers are not paid. Let me say that again – the editorial readers see $0.00 per article. They are doing this work, not for their reputation or quick cash, but because they care about the field in which they work. I tell those who submit articles to expect 3-4 months, so after that time you can inquire regarding an update. Actually, on one occasion, one reviewer took an extra long time because he became seriously ill for an extended period of time. On another occasion, we had to locate an expert to give counsel on a very specific subject. Many times an assessment is delayed due to unforeseen circumstances and it would do you well to consider that. 9. Do not expect your article to be accepted “as is.” This used to be very hard for me personally as an author, because I felt that by wanting to change my article, they were infringing upon the integrity of my piece of art. But this isn’t a painting, it is an academic article. These experts can teach you (whomever you may be) something and it behooves you to listen and show respect. This is how growing-as-a-professional works. You can certainly try and negotiate some of the changes, but please understand that shaping up an article for final publication is a team effort. Why fight what could be a better final product? 10. Celebrate every article you publish. Sometimes we are tempted to quickly move on and get another article or essay or review under our belt. But, truth be told, rejection could be just around the corner. Take a few weeks off, have a beer or soda with a friend, and be thankful you made it through the process, even once. Many researchers struggle to get published. It is a challenging thing – it is meant to be difficult, or else top-journals could not maintain their elite status (or issues would be thousands of pages long!). Give yourself time to take a breather before heading back out into the publishing trenches! If you have an article that you might be interested in publishing on Paul, please do think of us, as we are on the lookout for good contributions. 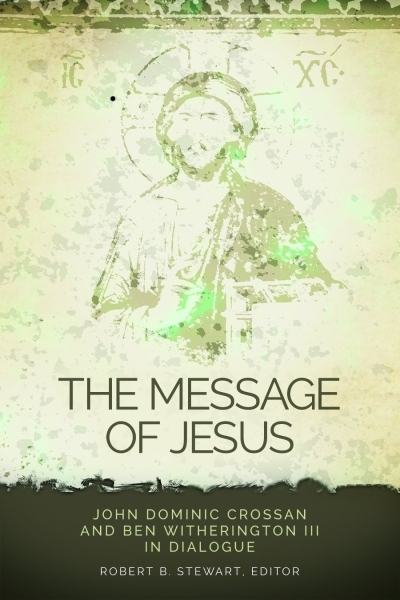 In 2010, the Greer-Heard Point-Counterpoint Forum focused on the topic of “The Message of Jesus” with speakers such as Crossan, Witherington, A-J Levine, and Darrell Bock. A book is being published by Fortress based on that forum. Fortress has, amazingly, made the first 40+ pages of the book (not yet published!) available for free on their website as a “sample.” This sample contains the dialogue between Crossan and Witherington – the Q & A is exceptionally candid and insightful. I dare to say that they gave away the best part of the book! As you read it, be sure to toast Fortress! I am thankful for a commenter who brought to my attention a new book (July 1, 2013) from Joseph Hellerman entitled Embracing Shared Ministry: Power and Status in the Early Church and Why It Matters Today (Kregel; 320 pp). Social historian and pastor Joe Hellerman addresses issues of power and authority in the church—in the New Testament and in the church today—in a fresh, culturally nuanced way. The local church, Hellerman maintains, should be led and taught by a community of leaders who relate to one another first as brothers and sisters in Christ, and who function only secondarily—and only within the parameters of that primary relational context—as vision-casting, decision-making leaders for the broader church family. Unique among contemporary treatments of servant leadership, Hellerman interprets the biblical materials against the background of ancient Roman cultural values, in order to demonstrate a social context for ministry that will provide healthy checks and balances on the use of pastoral power and authority in our congregations. This looks really interesting, and I am encouraged that Hellerman has the right historical knowledge as a social historian, and practical experience as a pastor! A rare, but necessary combo for a book like this! Resources on “Biblical Leadership”? Help! I am doing some research on “Scriptural Models of Leadership” for a course and I discovered something unfortunate. There tends to be two kinds of written resources on this subject. Either you have proof-text-laden iso-getical popular fluff, or you find very specific material on one verse or Biblical figure. What would you recommend a pastor read on the subject of “Biblical Leadership”? Parks, L. and B.C. Birch, Ducking Spears, Dancing Madly: A Biblical Model of Church Leadership (Abingdon, 2004). Stevens, M.E. Leadership Roles of the Old Testament: King, Prophet, Priest, Sage (Wipf & Stock, 2012). Ascough, R. and C.A. Cotton, Passionate Visionary: Leadership Lessons from the Apostle Paul (Hendrickson, 2006). Agosto, E. Servant Leadership: Jesus and Paul (Chalice, 2005). Tidball, D. Ministry by the Book: New Testament Patterns for Pastoral Leadership (IVP, 2009). A good pan-Scriptural study is D. Howell’s Servants of the Servant: A Biblical Theology of Leadership (Wipf & Stock, 2003). While the above studies are all fine and good, this is a real need – pastors could read loads of “leadership books,” but very few of the popular ones are based on a close reading of Scripture. I would appreciate your recommendations on this subject. A few years back, I interviewed Goldingay on my blog and at one point I asked him about the so-called Theological Interpretation of Scripture movement. Goldingay, to my surprise, bristled at the idea of letting tradition govern interpretation. I believe his exact words were, ” I am passionately opposed to conforming the reading of scripture to the church’s creeds and traditions.” Well, Bennett, as a student at Fuller currently and someone who is acquainted with Goldingay personally (and a fellow fan of his writings), took it upon himself to show that Goldingay actually looks more like an advocate and exemplar of TIS than he claims. [abstract] John Goldingay has tried to distance his exegetical practice from theological interpretation. Close readings of Goldingay’s own pronouncements and interpretive practice, in combination with insights from philosophical hermeneutics, however, indicate that he may be protesting too much. The present essay demonstrates that Goldingay’s working method operates under the rule of faith, in accordance with the creeds, and from an ideological location. It recommends Goldingay’s working method as an exemplar for those who wish to practice fresh, theologically informed, and exegetically sensitive readings of Scripture. Bennett was kind enough to share this essay with me and I found it very engaging. Anyone interested in hermeneutics (and that should be everyone, by the way) should check this out. Biblical Commentaries, about half a century ago, came in two basic types: either the stale, crusty, “criticism”-this-and-“criticism”-that type (with no theological interest or nearly none), or the popular “non-academic” devotional commentary to warm the heart and teach Christian-y platitudes. Well…times have changed. There are now well over 100 commentary series – and each series has numerous volumes. Some have balked at the production of each new commentary series. Sometimes I have wondered myself. However, the best kinds that are being produced, I think, are those that do a good job bridging the two older kinds – attempting to maintain both high academic standards as well as reflect theologically on the text in a way that invigorates the life, worship, and wisdom of the Church. So, I was interested in the latest commentary series from Baker called the “Teach the Text” series (eds. John Walton and Mark Strauss). I knew the series was coming soon, but I just discovered today it is already here! Apparently two volumes were released earlier this year: Romans (Marvin Pate) and 1 & 2 Samuel (R. Chisholm). I am most excited by the soon-coming volume from the late R.T. France on the Gospel of Luke (Nov 2013) and a volume on Acts by David Garland some time down the road. So – what’s the big deal with this series? Overall, the benefit of this series is that it is aimed at the busy pastor who wants a coach while working through a sermon series, a bible study group, sunday school, or for overall comprehension. From my quick glance of the Romans volume on GoogleBook, I could see lots of pictures (in full color! ), charts, and headings that were easy on the eyes. We must be careful that our pastors and leaders do not use such commentaries as crutches. But I can see this series offering an aid that helps pastors to make sure they are “on the right track” in their personal study, to think through preaching and teaching points, and to immerse themselves in a variety of interpretations of the text in art, culture, and the history of interpretation. For more information, see the well-developed series website. Have any of you dipped into the released volumes? What do you think?